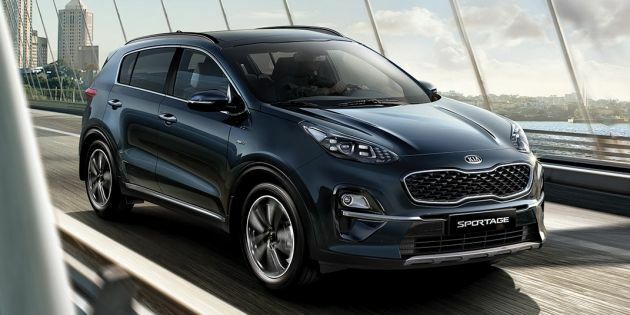 The facelifted Kia Sportage has made its way to Malaysia, and joins a number of new Kia models – Grand Carnival, Sorento and Optima – which were recently introduced by Kia Malaysia. Visual changes that come with the refresh include new bumpers front and rear, with the former being accompanied by LED headlamps and four-point LED daytime running lights like on the latest Cerato and Ceed. The lower apron is also new, with more prominent trim pieces that point towards the number plate holder. Elsewhere, there are revised fog lamp enclosures and at the back, the reverse lights and rear reflectors are now stacked on top of one another within a reshaped bumper. The Sportage will be offered in EX and GT-Line variants as before, with the GT-Line receiving its own unique touches to distinguish it from the EX. This includes a dedicated grille, LED-type rear combination taillights, rear trim accents, “ice cube” LED front fog lamps and 19-inch alloy wheels (18-inch units for the EX). Just minor enhancements on the inside, with a new steering wheel being one of them (flat-bottom unit on the GT-Line). 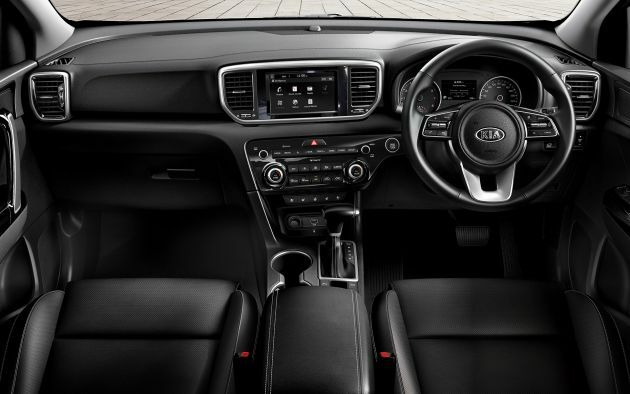 The kit list includes dual-zone climate control with rear vents, paddle shifters, alloy pedals, a powered tailgate, keyless entry and start, eight-way powered seats (driver only on EX, front passengers on GT-Line) and a seven-inch touchscreen infotainment system. Features like a Qi wireless phone charger and 4.2-inch multi-info instrument display (3.5-inch in the EX) are for the higher-end variant. The GT-Line also gets dual-tone leather upholstery as compared to the fabric material on the EX. Engine options are the same as before, with the petrol unit being a 2.0 litre Nu MPI four-cylinder, which is paired with a six-speed automatic transmission. Output figures remain the same, with 155 PS at 6,200 rpm and 192 Nm at 4,000 rpm. Meanwhile, the diesel option is a 2.0 litre R CRDi four-pot with 185 PS at 4,000 rpm and 400 Nm of torque from 1,750-2,750 rpm. An eight-speed automatic is mated to the oil burner, replacing the six-speed unit from before. Both variants are front-wheel drive. In terms of pricing, the Sportage starts from RM126,888 (on-the-road without insurance) for the EX, and goes up to RM149,888 for the GT-Line. Each purchase comes with a five-year/unlimited mileage warranty, and you have a choice of five colours – Mercury Blue, Fiery Red, Snow White Pearl, Iron Grey (EX only) and Cherry Black (GT-Line only). It’ll be nice if they include autonomous emergency braking (AEB) into the safety suite as well. That’ll be perfect. It’s like the Malaysian automotive industry was asleep for the first 9 months of 2018 then all off a sudden they all wake up and realised that there’s only 3 months left of the year. No AEB? This will be rip into pieces during eksiden. Still not giving automatic emergency braking and lane keep assist? The lack of these basic safety items are the reasons why i will not upgrade my Optima TF to the GT or other Kia models. Looks like Honda-sensing is the only option for mass market D-segment vehicles, even new Myvi has a basic AEB. Dear Gerald, I think you made a mistake. Sportage GT is AWD, not FWD. previous sportage gt diesel was 4wd, i am surprise to see this 2019 model is fwd. Its a good start giving extra safety feature without increasing in price..Most probably due to geely boyue going to launch soon with cheaper price and more advanced safety tech..We will start to see the ripple effect with other manufacturer soon..
Has this been launched in Malaysia?